A late touchdown pass from quarterback Andy Dalton to wide receiver Tyler Boyd gave the Cincinnati Bengals the last-minute lead and ultimately the 31-27 win over the Baltimore Ravens. Boyd thrived as Dalton’s go-to target all the way up to his game-winning reception, as he led the team with 91 yards on five receptions. Ravens running back Alex Collins stood out once again for Baltimore, rushing for 78 yards and a touchdown on 20 carries. Of course, his efforts weren’t enough to help his team come out with a win. 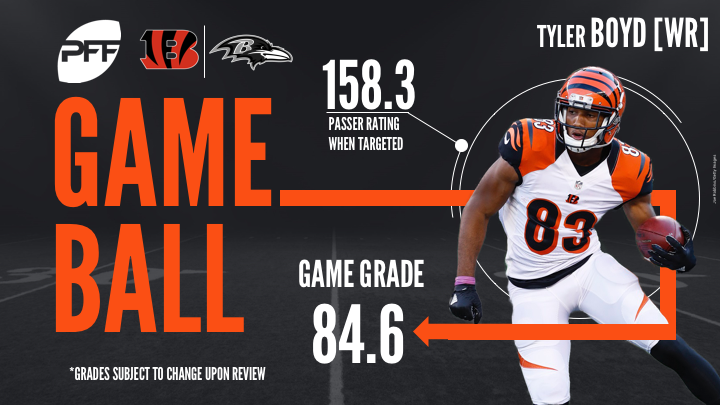 When the game was on the line, the Bengals threw the ball in the seam to Tyler Boyd, who took the play 49 yards for the game-winning touchdown. Outside of the biggest play of his career, Boyd recorded four other catches 42 yards. All of his targets came against Maurice Canady. Dalton ran hot and cold against the Ravens, either producing good throws or being very inaccurate, as he only hit on 52.3 percent of his passes. When he was pressured, his completion percentage dropped to 33.3 percent. Where Dalton succeeded was throwing the ball 10-plus yards down the field in between the numbers, as he completed 5-of-6 such passes for 101 yards and two touchdowns. However, when he attempted a pass under 10 yards between the numbers, he was just 3-of-8 for 21 yards. The rookie linebacker only played 23 snaps; however, he was very effective in coverage, allowing two catches for 15 yards and knocking down the ball on his other target. Also, one of his tackles in coverage was good for a defensive stop. The talk of the season has been the play of the other cornerback William Jackson (who was once again excellent). But this week, Kirkpatrick was able to show why he was a first-round pick in 2012. Kirkpatrick allowed just three catches on eight targets for 20 yards and knocked down two passes. He was tested frequently but came off the victor. The Ravens’ offensive line did very little to help Alex Collins. In fact, Collins gained 79 yards after contact and only had 78 yards total in the game. The play of the Ravens’ offense was the touchdown run, where Collins had to reverse field after being contacted four yards deep in the backfield. The Ravens ended up losing the game on a dropped pass that was intercepted and returned for a touchdown, which will go on Flacco’s stat line but was a good pass and had nothing to do with him. In fact, he received very little help from his pass-catchers, as Baltimore’s receivers dropped five passes. Williams is one of the premier run-stopping defensive lineman in the game, and he proved just that against the backup offensive guards for the Bengals. Even though the Bengals had success in the run game, their strong box-score production had more to do with their running backs being able to bounce out than the run near Williams in the middle. Even in the latter stages of Suggs’ career, he is still one of the better edge defenders in the league. Suggs can be a force in the run game or pass game and very rarely has a game of little value. Against the Bengals, he had four pressures and added three stops in the run game. He also blew up multiple plays before they had a chance to get going, as he was too quick and strong for the Bengals’ offensive line and tight ends.